The U-PASS is a bus pass plus more. Loaded right onto the Husky Card, the U-PASS provides members with unlimited rides on regional buses, commuter trains, light rail and water taxis as well as discounts on vanpools, carpools and other special offers. Most students on the Seattle campus are automatically U-PASS members, while faculty and staff must opt in to the program. Students and employees not eligible for one of the standard U-PASS products may buy equivalent products from Transportation Services. Please see the UW Bothell or UW Tacoma sites for their separate U-PASS programs. Harborview employees should check their intranet or call 206-744-3254. The U-PASS does not cover travel on Washington State Ferries. Your new U-PASS will ready for use within 24 to 48 hours after you purchase it or a week before the quarter starts. Students, please see the academic calendar for more specifics. To activate your U-PASS, you must tap it on an ORCA card reader within 60 days of issuance. ORCA card readers are found at the front of buses or mounted on a wall or pole at Link, Sounder or Swift stations. At RapidRide stations you have the option to tap on the ORCA reader at the station or on the bus as you enter. After tapping, wait for the green light to indicate your card was accepted. On a bus, you tap the reader just once, when you board. For Sound Transit’s Link light rail and Sounder commuter trains, tap the reader once before entering the train for proof of payment and tap again at your destination station as you leave. Your U-PASS is for your personal transportation only. It is non-transferable, meaning you may not give or sell your Husky Card or your U-PASS to any other person. Bus drivers and fare inspectors can confiscate a Husky Card that does not belong to you. All U-PASS members are bound by the U-PASS policy as stated in Administrative Policy Statement 53.4. Misuse of the U-PASS is subject to sanctions and may subject the parties to possible action under the General Conduct Code (Chapter 478–124 WAC) or the Student Conduct Code (Chapter 478–121 WAC). All students who pay the Service & Activities Fee (SAF) are automatically members of the Universal Student U-PASS program. A mandatory fee of $84 per quarter appears on tuition statements. Oversight of this program is through a student advisory board appointed by the ASUW and GPSS. To maintain your U-PASS activation between quarters, you must be registered for classes nine days prior to the next quarter start. Otherwise, your U-PASS will be deactivated and will be reactivated for transit 24 to 48 hours after you register again. For specific payment and activation dates, see the academic calendar. Withdrawing from classes will deactivate your U-PASS. If it is on or before the 7th calendar day of the quarter, you will receive a full refund of the fee. A 50 percent refund is available until the 30th calendar day of the quarter. No refund is available if you withdraw on or after the 31st day. Students not eligible for the Universal Student U-PASS may be able to purchase an optional U-PASS membership. The pass costs $150 and must be purchased in person each quarter. Professional & Continuing Education (PCE) students taking credit courses and International & English Language Programs (IELP) students, please purchase your U-PASS at the PCE office. PCE students taking non-credit classes are not eligible to purchase a U-PASS. ACCESS students and tuition-exempt students, please purchase your U-PASS at the Transportation Services office. Orca Lift: Discounted fares depending on income. Temp Pass: Working at the UW over the summer? You may be eligible to purchase a Temp Pass. Early Fall Start: Students taking part in the Early Fall Start or who are in an academic program that starts more than 12 days before Fall quarter start may purchase an Early Start U-PASS or parking permit. The Employee U-PASS is available for purchase by UW faculty and staff who are employed in permanent positions and working at least 20 hours a week. The fee is $25 per pay period, or $150 per quarter. Annual passes must be paid for by payroll deduction but can be cancelled at any time with no fee. They can be ordered online or in person. Quarterly passes can be paid for with cash, check or credit card but are not refundable. They must be purchased in person at Transportation Services. Please bring your Husky Card. Please note that annual U-PASS members who pay through payroll deduction will continue to be billed for the U-PASS until it expires or is cancelled. Members are financially responsible for the U-PASS and all associated charges, even if they separate from the University or are not receiving a paycheck. To cancel payroll deductions, contact Transportation Services to sign a stop-deduction form. To cancel an annual pass, email Transportation Services with the subject line: “Cancel employee U-PASS on MM/DD/YYYY.” Include your name, employee ID number, and a statement requesting cancellation of the U-PASS and payroll deductions. Your U-PASS will remain active and you will remain financially responsible for payments until you receive confirmation via email. We will do our best to cancel your U-PASS on the preferred date, but please allow 2-4 business days for processing. If you require cancellation on a specific date, please visit our office in person. Temporary employees or hourly employees working less than 20 hours a week are not eligible for a U-PASS issued on a Husky Card, but may purchase a Temp Pass with equivalent benefits. Employees must have an active status and a valid UW Employee ID number (EID). The Temp Pass must be purchased in person each quarter at the Transportation Services office. The fee is $150 per calendar quarter. Temp passes are non-refundable. Life doesn’t always happen to a transit timetable. If you need an emergency ride home to tend to a sick kid or have missed the last bus, we will reimburse you for up to 90 percent of your metered taxi fare (tip not included), up to 50 miles per quarter. Call any taxi or ride hailing service (town car and limousine services are not eligible). Request a receipt that indicates the pick-up, drop-off point and the fare paid, not including tip. You must be a current UW faculty or staff member with a U-PASS membership. Please submit receipts within the current quarter. We are unable to reimburse receipts that are more than three months old. We cannot reimburse for limousine or luxury car service. Emergencies include personal illness, illness of your child or dependent, a family emergency or an unanticipated need to work late when transit is unavailable or runs infrequently. Situations not considered emergencies include travel from work to a scheduled appointment; travel to a destination other than your home, park and ride, or daycare; travel from somewhere other than your worksite; and routine use of the program to a location with regular bus service. Mobility impaired customers who are eligible for the transit services below can pay for trips with their U-PASS. King County Metro Accessible Services: Contact the ADA Paratransit Program at 206-205-5000 (TTY Relay: 711). When booking your ride tell the service representative that you have a U-PASS. Community Transit Dial-A-Ride (DART): Call 425-347-5912 and tell the operator you’re going to pay for your rides with a U-PASS. When boarding the shuttle you’ll need to show your pass to the driver. Kitsap Transit ACCESS: When scheduling a ride on ACCESS tell the customer service representative that you are a U-PASS member. They will verify your U-PASS and record it. It is not necessary to show your pass to the driver. Pierce Transit SHUTTLE: Call 253-581-8000 and tell the customer service representative you have a U-PASS. Everett Transit Para Transit: When scheduling a ride let the customer service representative know you are paying with a U-PASS. When boarding the shuttle show your pass to the driver. Riders who book an inter-county paratransit transfer trip with their home agency pay only for their home agency shuttle, and therefore only need to tell that agency that they have a U-PASS. Riders who book a trip through a different transit agency are expected to pay full fare for that trip, and therefore should tell that agency that they have a U-PASS. For example: an Everett Para Transit customer booking an inter-county trip from Everett to Tacoma would notify Everett Para Transit that they have a U-PASS. Everett Para Transit would schedule the round trip, and the rider would only pay full fare each time they board Everett Para Transit (the home agency) no matter how many shuttles they ride. If the same customer calls King County Metro to book a trip from Seattle to another destination in King County, they would need to tell Metro that they have a U-PASS. 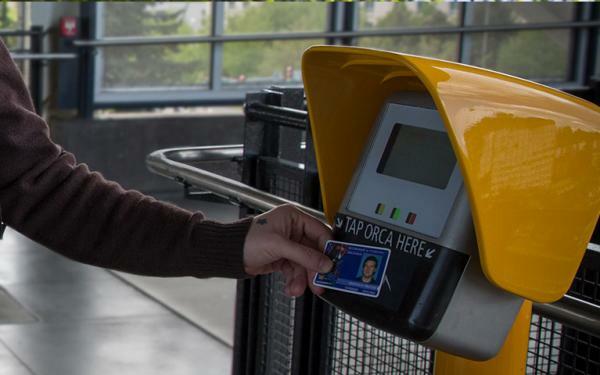 If you tap your U-PASS on an ORCA card reader and you don’t get a happy beep and green light, try again, making sure to tap your card on the ORCA logo at the center of the card reader and hold it there for several seconds. Also make sure you separate your Husky Card from any other cards you may have that include RFID technology (ie: UWMC badge). See this blog post for more tips. Keep your Husky Card healthy: Your Husky Card contains an antenna. If you cut, scratch, bend or punch a hole in the card you will damage the antenna and your card will not function properly. 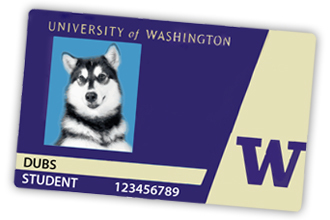 You must inform the Husky Card Office at once if you believe your Husky Card has been lost or stolen. The best way to report a lost or stolen Husky Card is through the Husky Card Online Office, where you can suspend activity on your Husky Card Account until the Husky Card is found or replaced. You may also contact the Husky Card Office at 206-543-7222 or by email at huskycrd@uw.edu. There is a $25 replacement fee for your Husky Card, but no additional fee to replace the U-PASS. Once the Husky Card Office issues a new card, your U-PASS will be transferred electronically and will be available for use 24 to 48 hours after card replacement. You must use your Husky Card on an ORCA card reader within 60 days of receiving your replacement Husky Card to finalize your U-PASS activation. To replace a Temp Pass, please visit the Transportation Services office. You cannot register your Husky Card with the ORCA system. You cannot load funds into an ORCA E-Purse using your Husky Card. You could technically load a PugetPass or Washington State Ferries pass onto a Husky Card but we don’t advise it as the pass will be lost if your card is lost, stolen or damaged. To purchase a standard ORCA Card and take advantage of the E-purse, card registration, autoload or other ORCA program features, please go to http://www.orcacard.com. No personal information is stored on your Husky Card’s smart chip. Data on the chip indicates if you have an active U-PASS and information about your most recent transit trips. Travel data is also stored in the ORCA databases controlled by the transit agencies. This data is used for billing purposes in order to support transfer functions and fare apportionment amongst participating transit agencies. For more information, read the ORCA privacy statement. The UW does not track where you use your U-PASS. Transportation Services is the only office with information on who has a valid U-PASS and will keep this information private in accordance with UW privacy policies. Transportation Services staff do not have access to personally identifiable travel data.